An innovative hands-on exploration of the development of the Georgian city of Bath. 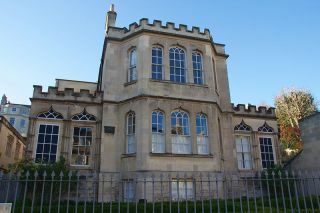 The museum, which is housed in the historic Countess of Huntingdon's Chapel, interprets the architectural heritage of Bath, tracing the personalities and work of the architects and craftsmen responsible for transforming the medieval core of the city into the elegant Georgian city we can see today. See how classical designs of the Greeks and Romans influenced the style of Georgian Bath, and get an idea of how a house was constructed from bottom to top. Among the highlights of the Building of Bath Collection are original portraits of architect John Wood, responsible for creating Queen Square, and a section of the original balustrade from the square. See original joiner's tools, woodworking chisels, and tool chests, paint boxes, sections of hand-moulded 18th-century plaster, 300-year-old maps of Bath, a surveyors theodolite and drawing instruments, and a stone acorn from the parapet of the Royal Circus. In the same building as the museum is the Bath Model, a scale model of the centre of historic Bath, which gives marvellous insight into the layout and Georgian character of the city. The Building of Bath Collection is housed in a lovely Georgian chapel built for Selina Hastings, Countess of Huntingdon, and a section of the museum is set aside for an exhibit about the Countess's life and times. The Countess of Huntingdon was a friend of Horace Walpole and an ardent Methodist. She built a number of Methodist Chapels around the country, but this is the only one of her chapels that still survives. The Gothic Revival style used here may have been influenced by Walpole's own house at Strawberry Hill. The chapel was converted into a space for the Building of Bath museum in 1992.